We saw a very large 'vee' of them flying over our house in South London this morning between 9:30 and 10 am. We are about 5 minutes north of the 401 near Wellington Road. We had no idea what they were! At first we thought that they were regular swans - which I had never heard of flying in such huge number in a vee formation - not to mention that the sound of these birds was not the same as regular swans I had heard in the past. It was a large 'vee' containing more birds than I've ever seen in a Canada Goose 'vee'. Edit: We also heard that there were migrating Swans on the ice seen from Pearce Park and Tyrconnell on March 13th & 14th and also some flying over the lake (going inland) and in the Fingal area west of St Thomas. Thank you Lily and James for your submission to our website! Made an earlier post but didn't say where we were lol. Have seen 2 flocks of these in huge numbers in the past 2 days. It was an amazing site. Our weather must certainly be changing to have such birds here. I have never in my life seen such a thing. have seen 2 flocks of these in the past 2 days. I couldn't believe it. Our weather must certainly be changing to have these birds here? I saw two flocks of tundra swans today (Feb 27, 2012) at around 11:30 AM, near New Dundee, Ontario. 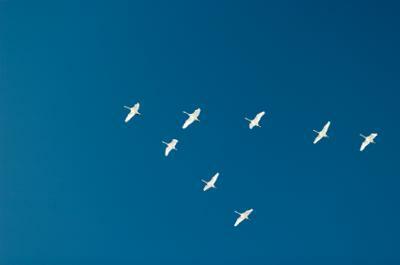 Each flock was made of about 20 birds, and they were flying from North-East to South-West. Go and see the swans! Lily and James, you really should drive to a swan site and see them. There were about 1,000 on Greenway Road, south of Grand Bend yesterday. I am sure there are even more today because the conditions are perfect for them!